ONE of the more unusual aspects of Helensburgh and district railway history was a fire that destroyed the signal box at Cardross on the evening of April 26 1971. A very drunk passenger missed his stop, disembarked at Cardross and proceeded to cause mayhem. The signalman, Jack Vickers, fled the box, whereupon the drunk set fire to it. When the fire broke out, the power from the 25,000 volts overhead wires was switched off. Firemen fought for two hours to deal with the blaze, and the Glasgow to Oban train had to be held at Dumbarton for an hour. Soon after, a Glasgow man was charged with setting fire to the signal box and committing a breach of the peace at the station. Signalling equipment was removed from the signalbox at Croftengea, one of the dyeworks in the Vale of Leven with its own railway sidings, which was at that time disused, to replace that destroyed at Cardross. 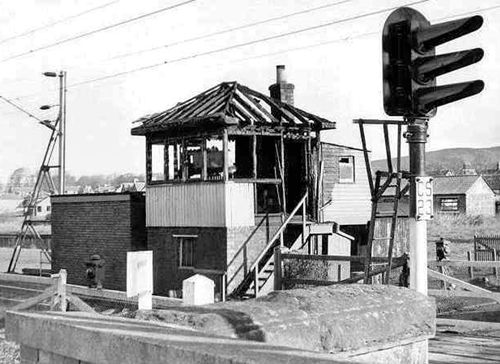 The replacement equipment was situated in the station buildings, with an external release mechanism for the level crossing gates, and Cardross signalbox was demolished. Mr Vickers moved to work at Garelochhead signal box.